This delightful property is located in Paynes Bay on the West Coast of Barbados. It borders the elite Sandy Lane Hotel and Golf Course. The main house consists of 2 bedrooms with ensuite bathrooms in each bedroom. There is an attached one bedroom apartment which is rented separately or together with the main house, it is ideal for groups or families who are vacationing together but still want to maintain their privacy. Mystic Rose is situated in an exclusive residential area called White House Terrace; this is located directly across the road from the beautiful Paynes Bay beach. 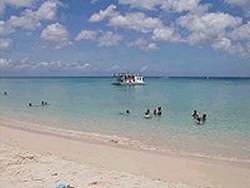 The beach here, is considered one of our best on the West Coast with its calm waters and white sands. Mystic rose is located at the end of a cul-de-sac in a quiet and safe neighbourhood, there is no through traffic or passers by. This makes it ideal for families and those traveling with children in particular. 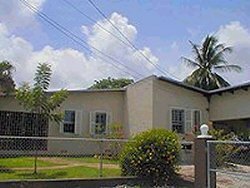 This property consists of a two bedroom house and one bedroom self contained apartment both have separated entrances and their own private gardens which are fully enclosed by walls and lockable gates. The house and apartment have a connecting door inside the property which is only unlocked when both the house and the apartment are booked by the same person. Therefore this property is ideal for 3 couples or a large family. 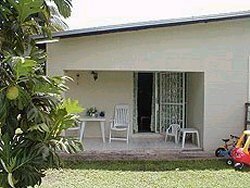 This accommodation is very flexible as the house is designed to be used as a single, double or triple unit depending on your needs. This house is very accessible to transportation, restaurants, bars, nightlife and water sports which are all located within walking distance. 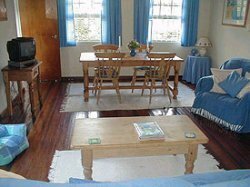 Both the house and the apartment are tastefully furnished with Victorian pine furniture and colourful drapes. The Main house has a bedroom with a double bed and the other with a pair of twin beds. The fully equip kitchen is spacious with microwave, toaster etc. The large Living/ Dining area has TV, Video and office area with a telephone. There is an open air sunroom ideal for barbeques, breakfast or private sunbathing. Top of the range ceiling fans keep this house cool through out the year. Mystic Rose house sleeps four adults and two children and additional beds can be provided. The apartment has one bedroom with twin beds and a large couch in the living room, which along with a fold away bed sleeps up to 4 adults. There is a large bathroom with shower, a well equip kitchenette and cozy Living/Dining area with telephone, TV and video. Enjoy breakfast on your private patio. There is an a/c unit in the bedroom and a ceiling fan. In the living room there are also standing and portable fans. Both apartment and house have maid service twice weekly (this does not include dish washing) and share free laundry facilities. In each unit there is a small safe for passports and valuables. There is also parking for as many as four cars in the driveway.